Both South Africa and the United States experienced mass shootings recently. Eleven young black men were shot and killed in Marikana, Phillipi East, an informal settlement 25km from Cape Town on Friday 29 September; on Sunday 1 October 59 concert-goers attending a country music festival in Las Vegas were gunned down. While worlds apart, in more ways than one, both mass-shootings have three things in common. By PETER STOREY and ADELE KIRSTEN. First, innocent people were killed: Tourists in Las Vegas, neighbourhood patrollers in Marikana. According to news reports the patrollers were forced to take action against crime and gangsterism in their community because the police refused to patrol after sunset. In retaliation, local gang members targeted those on patrol. Second, firearms, which are designed solely to kill, were used to efficiently gun people down; that automatic weapons were used in Las Vegas accounts for the higher number of deaths in the US. Finally, the reason that guns were so readily available to shooters in both incidents can be directly linked to poor firearms control management by the governments of the US and SA. Criticism has been heaped on Donald Trump and his government for failing to mention gun control in any statements following the Las Vegas massacre. Historically, all attempts to control guns in America have been vehemently opposed by a powerful and well-resourced lobby group, the National Rifle Association – which contributed $30-million to Trump’s campaign. Unlike the US, South Africa has a world-class gun control law. Research published in international and peer-reviewed journals proves that the Firearms Control Act (2000) has saved thousands of lives and is the only reason that our femicide rate, which counts the number of murdered women, has dropped nationally – from four women killed a day in 1999 to three in 2009. But, and as the Philippi shooting proves, a law is only as good as its enforcement. 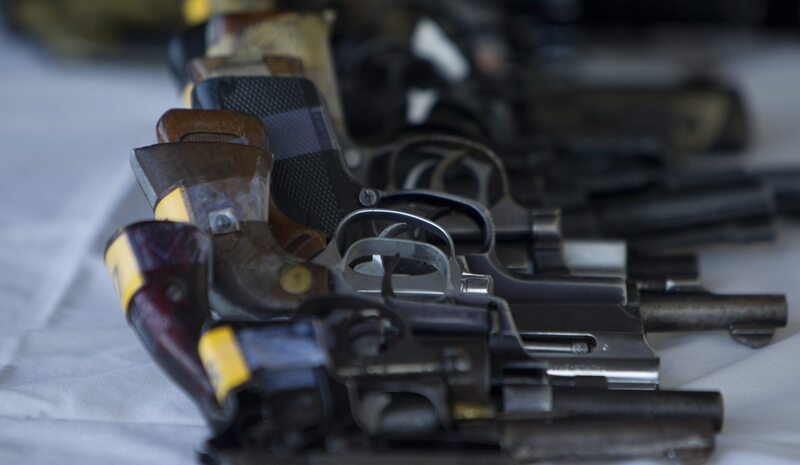 Since 2010 a range of sources, including court documents, parliamentary oversight reports and media exposés, point to a breakdown in SA’s firearms control management system. This breakdown introduces the first stark difference between the mass shootings: The legal status of the guns used. In the US all 40+ guns found in the shooter’s Las Vegas hotel room and home were legally acquired; in SA it’s likely that all guns used in the Phillipi East shootings were illegal. This is because poor enforcement of the Firearms Control Act by the government since 2010 has created numerous holes through which guns are leaking from the legal pool into the illegal pool, which has no mechanisms in place to regulate possession or use. One of the most high-profile gun-leaks involves a police officer, a gun dealer and a businessman: Colonel Christiaan Prinsloo was recently sentenced to 18 years imprisonment for selling approximately 2,400 guns “destroyed” by police to gangsters in the Western Cape; two of Prinsloo’s alleged accomplices, businessman Irshaad Laher and gun dealer Alan Raves, have yet to stand trial for their role in leaking guns to gangsters. Faced with a growing pool of illegal guns resulting from police corruption, incompetence and a lack of political will, the government must take two immediate remedial actions: Firstly, “mop up” illegal guns through both search, seizure and intelligence driven police operations and incentivised gun hand-in campaigns such as an amnesty or gun buy-back. Second, plug the holes through which legal guns are leaking into the illegal pool; the most effective way of doing this is for our leaders to boldly and courageously declare South Africa a gun-free country. Police leaders have done neither; instead they’ve continuously shafted two of SA’s most experienced organised crime prevention and gang experts, Majors-General Peter Jacobs and Jeremy Vearey. The pair, who headed Operation Impi (a gun smuggling investigation which oversaw the prosecution of Christiaan Prinsloo) were demoted months before Prinsloo’s accomplices’ trial could begin; as they point out in labour court papers challenging their demotion, rather than being supported, “the SAPS has elected to curtail our investigations by transferring us and decimating the team we supervised”. Even after winning their labour court case, which ruled that both return to their “before-demotion” positions, SAPS has refused to allow Jacobs and Vearey to continue their work, opting instead to appeal. In the meantime the guns keep shooting and shooting; not affluent concert goers, but young black men living in marginalised communities whose names and stories will never be documented by global media outlets to provoke public grief, anger and calls for action. Without media attention and public outcry these killings will continue; SAPS leadership is too immersed in toxic politics to take any meaningful action against gun violence drowning communities, unless forced to do so. Perhaps the only real option to force leaders to take action against crime is to compel SAPS to pay compensation for inaction; according to Jacobs’ and Vearey’s court papers, 888 of the 2,400 guns stolen by Prinsloo are forensically linked to 1,066 deaths, including 89 children. With more than 1,100 guns that Prinsloo admitted to stealing still missing, the killings will continue. Rev Professor Peter Storey is Gun Free SA Patron and Adèle Kirsten is GFSA Director.